Alfa Romeo 164 PDF Workshop and Repair manuals, Wiring Diagrams, Parts Catalogue, Fault codes free download! Reference Repair Manual Alfa Romeo 164, as well as a manual for the operation and maintenance of Alfa Romeo 164 cars from 1987 to 1995. release, equipped with gasoline engines Twin Spark working volume of 2.0 liters. and V6 / QV with a working volume of 3.0 liters. In the individual sections of the manual are placed the instruction manual for the Alfa Romeo 164, the maintenance advice and the electrical circuit diagram (wiring diagram) of the machine. 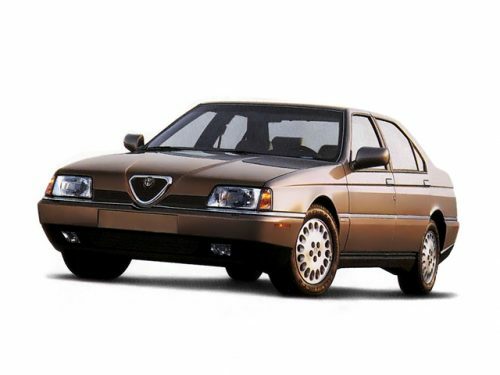 Alfa Romeo 164 is a business car manufactured by Alfa Romeo. Produced from 1987 to 1998. Produced in the back of the sedan. Design was developed by Enrico Fumia from the Pininfarina studio. It was the flagship model of the brand Alfa Romeo. A total of 273,857 cars were produced. In October 1978, Alfa Romeo, FIAT, Lancia and Saab agreed to develop separate business-class models on the Type Four platform, thus, in the development process there were such cars as Alfa Romeo 164, Saab 9000, Fiat Croma, Lancia Thema . FIAT and Lancia were similar to Saab in many aspects, but Alfa Romeo shared only the chassis with them. There were versions with 2 and 3-liter engines. The peculiarity of the 2-liter engines was that they used a TWINSPARK system with two spark plugs per cylinder, as well as a phase-regulating system (before the release of the famous Honda VTEC), a special 3.5-liter V10 engine was also launched, the version was called Alfa Romeo 164 Pro-car.